Did you know that some viruses can live up to seven days on household surfaces? In addition, studies have found that an average home can house over 340 different types of bacteria! 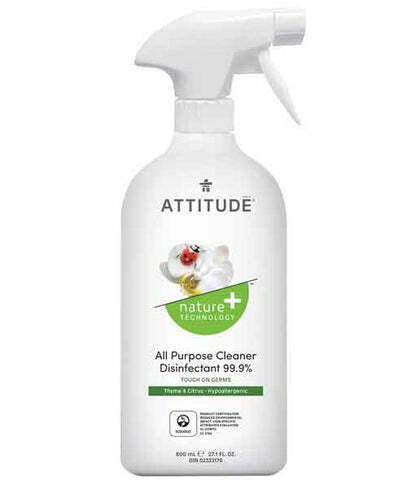 Keep household germs away with ATTITUDE’s Nature + TechnologyTM All Purpose Cleaner Disinfectant 99.9% – Thyme & Citrus. Its worry-free and hypoallergenic formula is developed with plant- and mineral-based ingredients such as saponin for a natural way to clean your home! Formula made with saponin and green tea extract, two natural and antibacterial cleaning agents.